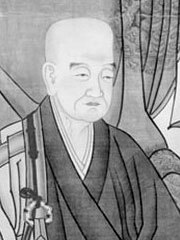 Myōan Eisai (明菴栄西) (April 20, 1141–July 5, 1215) was a Japanese Buddhist priest, credited with bringing the Rinzai school of Zen Buddhism and green tea from China to Japan. He is often known simply as Eisai Zenji (栄西禅師), lit. «Zen master Eisai». Born in Bitchu province (modern-day Okayama), Eisai started his studies of Buddhism in a Tendai temple. Dissatisfied with the state of Buddhism at the time, in 1168 he set off on his first trip to Mt. Tiantai, the home of the sect, where he first encountered Chan (later known in Japan as Zen) ideas. He spent only half a year in China this time, but returned in 1187 for a longer stay as a disciple of Xuan Huaichang. After his certification as a Zen teacher, Eisai returned Japan in 1191, bringing with him Zen scriptures and tea seeds. He immediately founded the Hoonji Temple in remote Kyushu, Japan’s first Zen temple. Eisai set about slowly propagating the new faith, trying to gain the respect of both the Tendai school and the Imperial court through careful diplomacy. Faced with the opposition of traditonal schools of Buddhism such as Tendai, Shingon and Pure Land, Eisai finally left Kyoto for the north-east to Kamakura in 1199, where the Shogun and his warrior caste of Samurai enthusiastically welcomed his martial-arts-oriented Zen teachings. Hôjô Masako, the widow of Yoritomo, allowed him to build Jufukuji, the first Zen center in Kamakura. Eisai died in 1215 at the age of 75. His disciple Dogen went on to found the Soto school of Zen in Japan.